Fig. 194 Value-created model . an analytical framework that builds on the concepts of VALUE ADDED and CONSUMERS’ SURPLUS and assists business strategists to identify opportunities for establishing COMPETITIVE ADVANTAGES over rival suppliers and to increase the firm's profits. the value of perceived benefit of the product to the consumer, part of which is the value of the product embodied in the actual price the customer is required to pay (P) and part of which is the extra value received by the consumer in the form of the consumer surplus (B-P). The consumer surplus is the difference between the price the consumer actually pays compared to the price the consumer would be prepared to pay, that is, if the product's actual price is £50 and the consumer would have been prepared to pay £75, the consumer surplus is £25. 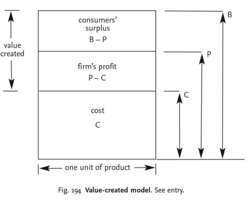 The total value created thus consists of the firm's product and the consumer surplus. The model is useful to strategists in that it enables them to explore various ways of establishing competitive advantage over rival firms and increase profit potential. To illustrate it, the firm can reduce its costs (while keeping perceived benefits unchanged) then either it can continue to keep its price unchanged and obtain higher unit profit margins or it could lower its price, undercutting the prices of its competitors, thus gaining market share. See COST DRIVERS. Conversely, if it can increase the perceived benefits to the consumer (while keeping costs unchanged), it will encourage customers to switch away from competitors, thus gaining market share, Increasing perceived benefits can be done through ADVERTISING extolling the attractions of the product and increasing the quality of the product. See BENEFIT DRIVERS. The firm can also explore ways of capturing more of the consumer surplus through differential pricing and various MARKET SEGMENTATION strategies. See RESOURCE-BASED THEORY OF THE FIRM, VALUE CHAIN ANALYSIS.